← Ideas for Great Canadian Stories…with international twists! The nature of writing posts about recurring topics, and the self-assigned task of (for the moment) trying to post something every few days so that this blog can be seen as vital and active, means I can find myself returning to similar topics in multiple posts. A while back, I posted an essay on my site (The Great Canadian Guide to the Movies & TV) musing about the different ratings for Canadian TV series. 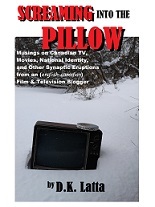 Recently a number of Canadian TV series have done really well. I mean winning their time slot, well. I mean, crushing-the-American-series-they’re-programmed-opposite well. Yet in many cases these series were all co-productions with Hollywood. But unlike the past generations of such series, these are unarguably Canadian, and they are often set in Canada. And my question was: did having a Hollywood partner — essentially American “approval” — give these series a certain cachet value with the Canadian audience? Or, for that matter, did the Hollywood connection mean these series received better publicity and better promotion in the Canadian press (and on the networks themselves) than the average homegrown Canadian series which has to struggle to build an audience through word-of-mouth? The CBC’s light-hearted private eye series, Republic of Doyle, had solid ratings all along, but it’s certainly seen consistently bigger numbers this season. And this season kicked off with a much-publicized episode guest starring international movie star, Russell Crowe. And even though Crowe was only in one episode, did people tune in for him…and decide to stick around for the rest of the season? Or for that matter, did people tune in simply because the press coverage of Crowe’s appearance in the show raised the series’ overall profile among potential viewers? The CBC’s Little Mosque on the Prairie, whose early ratings I believe set a record no Canadian scripted series has beaten since, was not a Hollywood co-production — but it did receive an almost unprecedented amount of media coverage. And much of the Canadian media coverage was less about the show itself…than it was the astonishing media attention from the international press. So it enjoyed both a lot of domestic press…and the cachet value of being something that caused the international (and American) press to take note. And that relates to my point about Canada-US co-productions. Because these aren’t simply “great” shows pluckily winning an audience through their own merits. Some might be — though, equally, some I personally find less compelling than some series with lower ratings. But that’s not the point! These series are premiering with, in some cases, jaw dropping (by Canadian standards) audience numbers. And maybe that’s a point worth emphasizing since it seems to be missed — or deliberately misconstrued — by both the press and the network publicists. Premiere episode ratings are not an indication of how “good” or “bad” a series is. Premiere numbers merely indicate the audience was curious. The real test is in how well the ratings hold, and where its number are by the end of the season. That’s why it can be kind of bizarre when programmers will sometimes announce they’ve commissioned a second season on the strength of the premier’s ratings. A decision that can look very ill advised if the ratings then crash through the pavement and end up in the sewer before the end of the first season. Though I suspect even that’s part of the PR. The programmers are hoping a potential audience will be impressed by the announcement that the series is sooooooooo good it’s been renewed even before it’s three episodes into its first season. Other tricks include press releases continually harping on the “premier” ratings…even when a series is in its second season or talking about “average” audience numbers, which could indicate it opened with great numbers, but finished with terrible numbers, but if you average them, you can pretend it had decent numbers throughout. Anyway…back to my topic about these Canada-US co-productions boasting great numbers. In many cases there’s nothing necessarily that catchy about the basic concept — cop shows, medical dramas. Perhaps equally interesting is that some of these series do better in Canada than they do in the United States — The Listener is in its third season in Canada (still bringing in million plus viewers) but only ran one year in the U.S., and Combat Hospital was cancelled after one season in the States, despite being a bonafide hit in Canada. I was thinking about this reading about the premier of the new medical drama, Saving Hope. Though its American numbers were tepid, its Canadian premier was an impressive 1.5 million…and holding! Over at Showcase, their sci-fi action series Continuum opened with something like 900 000 viewers — which given Showcase is a cable station and often breaks out party hats if its shows top 200 000 is nothing short of amazing. Now Continuum has seen a significant drop, down to around 400 000 per episode. In most cases that would be seen as a serious haemorrhaging of viewers but, as I say, that’s still good for Showcase. The opening numbers were so good, it can afford to lose some — like a fat person on an extreme diet, we can be concerned about the rapid weight loss but no one’s predicting kidney failure…yet. Now what strikes me as curious about these numbers — is that they seem completely unexpected. I mean, Continuum is a sci-fi drama — and sci-fi often has trouble landing mainstream audiences. And Continuum just seems like a resurrection of the kind of straight-to-syndication sci-fi and action series done a few years ago and which were often cancelled after one season. (I’ll be up front: after the first few episodes, I’m finding Continuum suffers from bland characters and paper thin plots). While Saving Hope is a strange animal. I mean, there’s nothing entirely wrong with it. The actors are good, the pacing okay. It trots out all the usual medical show cliches of ethical dilemmas and mysterious ailments. Yet — so far — I’m finding the series rather bland and uncompelling (I found Jozi-H a few seasons back more dramatic). And so far, the various plots do seem a bit stock, like they’re cribbing storylines from Grey’s Anatomy or something, but doing them in a perfunctory sort of way. The main hook to Saving Hope is a slight supernatural aspect of a character who’s in a coma and wanders the halls as an unseen astral projection. Frankly, it can feel like something just tacked on at the last minute in an effort to make a generic medical drama seem a little less generic. Personally, I’d suggest they should actually make it a “supernatural” drama where he impacts on the plots (or maybe has a mystery to uncover). So…what’s my point? It’s not really to diss Saving Hope or Continuum — honest! It’s merely to point out that I’m not quite sure why they burst out of the gate with such stellar numbers. Given the plethora of medical dramas already on TV (many cancelled within a season) why did 1.5 million Canadian viewers decide they had to tune into Saving Hope? Why did 900 000 viewers chose to make Continuum Showcase’s highest rated premiere…possibly ever? In both cases, on paper, there’s nothing that really would make me anticipate that. Even if we factor “star power” into the mix, I find it hard to believe the actors brought enough fans with them to explain the opening numbers. I mean, maybe I’m wrong. Maybe 1.5 million Canadians had been sitting around saying to themselves: “You know what I’d really like to see? Grey’s Anatomy with a sprinkle of The Ghost Whisperer. And if it starred Lois Lane and that nice young man from StarGate — perfecto mundo!” And then they turned to the TV listings and, presto, saw their dream fulfilled… Maybe. And I’m not saying these series shouldn’t have opened with solid numbers. Nor am I saying that they might not build on those numbers by word of mouth (whatever I, personally, might think of them). What I’m saying is why did these series (and the others before them) open with such impressive numbers? And I wonder if it’s a combination of two things — Canadiana, and publicity (combined with the American stamp of approval). Maybe this proves there is a hungry audience eager to see and support Canadian productions, who want to see Canadian cities be themselves. Nor is that somehow a mark against these series, or an indication their popularity is somehow fallacious or artificial (after all, people freely point out that critically acclaimed non-American programs often have trouble winning an American audience in the States, indicating Americans tend to favour American programs). And patriotism isn’t going to make an audience stick around if they aren’t enjoying themselves. But these good opening numbers might indicate Canadian viewers actually do have an interest in seeing Canadian shows. Yet maybe that “Canadianness” is then enhanced by the American connection — that knowing these are series airing on U.S. primetime, and with U.S. money behind them, it placates any self-doubting Canadian. It’s a Certificate of Quality, if you will. So they tune in because it’s a Canadian series with American approval…and then stick around because they are enjoying it, no longer as concerned if it gets cancelled in the U.S. So where does that take us? Well, it’s both good and bad. It’s good because it shows Canadian shows can win a Canadian audience — an audience eager to watch the shows as the opening night numbers indicate. And though some of these series fail in the U.S. it’s not really a big deal, because lots — no, lots — of American series fail there, too, and it’s hardly a stigma. And some don’t fail. Flashpoint ran four years on CBS and though the American network finally parted company with it…that’s still 3 1/2 seasons longer than series that get cancelled in their first year. Rookie Blue is in its third season on ABC…while the conceptually similar American series, NYC 22, has an uncertain future after only a handful of episodes. But it’s problematic if the success of these shows in Canada is because of the American connection. It’s a problem because it means programmers are stuck trying to appease two market places, and sometimes the Canadian one gets sacrificed. The Listener has kept going despite losing its slot on NBC…but Combat Hospital, which I believe was actually enjoying better ratings in Canada than The Listener, was cancelled entirely when ABC lost interest. And if the Hollywood connection is the secret ingredient — is that because of the audiences’ pre-conception (conscious or unconscious)? Are they willing to give an American-produced Canadian series a chance when they would regard a wholly home grown series with more cynicism (despite that fact I would say the CBC’s Arctic Air is as professionally put together as Saving Hope — and is a better series)? Still, that might not be a problem…if it’s the wedge that opens the door for everyone else. If Canadians start watching Canadian series regularly, and enjoying them, that might well trickle down to the non-Hollywood supported series. Certainly as I said, Republic of Doyle has seen its numbers steadily climb, and Arctic Air, though not receiving Saving Hope style numbers, enjoyed stronger first season ratings than a lot of recent all-Canadian series. But the bigger question is, does the problem lie, not with the public at all — but with press, and the network promotion? Is it that homegrown series just don’t receive the kind of extensive coverage that the Hollywood-supported Canadian series do — the TV commercials, the newspaper write-ups, the celebrity interviews? It isn’t that the Canadian public is deliberately choosing a Canadian series with Hollywood backing over a Canadian series that has gone it alone…it’s that they literally aren’t fully aware those latter programs exist. If that’s the case, it does point to a solution — the Canadian press needs to devote as much attention to Canadian-Canadian programs as they do to the Hollywood-supported Canadian programs (and the production companies and networks need to ratchet up their PR efforts). Series like Entertainment Tonight Canada need to actually devote a significant portion of their episodes to reporting on Canadian productions…instead of making most of their “Canadian” segments simply reports about Canadians working in Hollywood (or seeing themselves as the 5 Days a Week Justin Bieber Show!). But getting the press (or the PR flunkies) to change their attitudes…might be an even more daunting task than getting the Canadian public to change theirs! This entry was posted in Canadian film and TV and tagged Arctic Air, Combat Hospital, Continuum, Entertainment Tonight, Flashpoint, Grey's Anatomy, Jozi H, Little Mosque, Republic of Doyle, Rookie Blue, Saving Hope, StarGate, The Listener. Bookmark the permalink.